Starting a young horse is not for the inexperienced or unprepared warns Clinton Anderson. In this article he shares his top tips for a successful first few rides. Safety in preparation The biggest thing my mentor Gordon McKinlay instilled in me when starting colts is that preparation is 99.9 percent of your success. The better prepared your horse is to be ridden, the better your first ride will be. Gordon was meticulous about not getting on a horse until he was ready. I could be working with a young horse and Gordon would come down and say, ‘Is he ready to ride?’ I’d say, ‘No, he needs another day or two’ and he was fine with that because if you get on a horse before he’s ready, you’re going to get bucked off and plant a bad habit in the horse’s mind. Don’t be a hero I left Gordon’s to apprentice with Ian Francis and he had the same philosophy. He always told me, ‘There are a lot of heroes in the graveyard.’ He was referring to all of the people who get on their horses too soon, get bucked off and break their neck. Both men, but especially Gordon, taught me that preparation is everything in starting colts. Get him moving In my first colt starting lesson, Gordon taught me the importance of not only walking and trotting a colt during the first ride, but also cantering. Cantering picks up the colt’s energy level and frees up his mind. Most people think that you should only walk the horse during the first ride, but I quickly learned that unless you get a colt cantering and moving, he’ll develop ‘sticky’ feet and start to get resentful or lazy about having to move. That’s when he starts to develop bad habits like bucking or rearing. Equal doses I usually spend five to seven days working with a colt on the ground before I ride him for the first time, even if he’s really quiet. I learned early on that colt starting isn’t just about desensitising your horse, but sensitising him as well – getting him to move his feet, yield and soften to pressure. 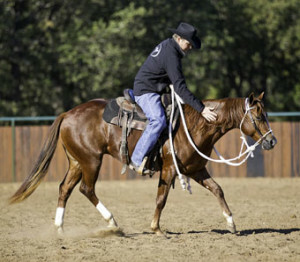 The better your horse understands how to move his feet and yield to pressure on the ground, the easier it’ll be for him to do the same thing under saddle. A tired colt is a good colt If you over feed and under work your colt, you’re just asking for trouble. I’ve never seen a tired colt, one that’s relaxed and had a lot of miles put under his feet, give anyone any trouble. I have however seen fresh and overfed colts rear, buck and do all kinds of dangerous things because they’re feeling so good that they want to explode out of their skin. Be realistic about your ability The best success tip I can give anyone thinking about starting a colt is to be realistic about your ability. If you’re a green rider and you’re frightened to trot and canter, the last thing you need to do is start a colt. You should have an independent seat, which means that you can walk, trot and canter on a loose rein and you don’t need to squeeze with your legs to stay in the saddle. If you’re not confident in your ability to stay with a horse, then you’re not ready to start colts. Don’t fold to peer pressure Don’t ever get on a horse because somebody is pressuring you. I don’t care if it takes two days or two months before you get on a horse; take the time you need to prepare him now so you don’t get in trouble later. If you’re not 90 percent sure it’s going to be a textbook ride, don’t get on. I say 90 percent sure because with colts you can never be a hundred percent sure that everything is going to go according to plan. The first six weeks The first six weeks of a horse’s life under saddle is the most crucial time of his career. Whatever a horse learns first will be the thing that sticks with him for the rest of his life. So if you teach him that it’s OK to buck, run away or be stiff and heavy, it’ll take a long time to undo the damage. However, if you teach the horse in the first six weeks that he needs to be soft, supple and relaxed, it’ll the lay the foundation for everything else you do with him. Colts are unpredictable Most people don’t realise just how unpredictable and dangerous horses can be. Horses aren’t man killers or aggressive by nature, but they’re big powerful animals with an extremely fast reaction time. Think of a colt like a small child. Just like kids, your colt is going to do unexpected things. He’s going to be unpredictable. He might spook and jump sideways 10 feet, and if you’re not good enough to sit on him, you’ll be on the ground before you blink your eyes. I’ve seen every wreck you could ever have with a colt. Don’t be fooled A lot of people will raise a foal in their backyard and get tricked into thinking when they go to start him as a 2-year-old he’s going to be the same, quiet, easy going horse. Some colts will stay quiet, but a lot of them react when you introduce the saddle and a rider’s weight. I think sometimes people forget that everything you’re doing with a colt from the first ride on is a brand new experience for him. Take nothing for granted, and never assume a horse is safe, always make him prove it to you. Don’t let a bad habit form One of the most important things you can do with your colt is to not let him form any bad habits, especially bucking. You’re better off not letting him learn that he can buck someone off rather than having to spend the time and effort to fix his behaviour. If you need to spend an extra two or three days on the ground preparing the horse to be ridden, do it. What is a week or two out of a horse’s life to prepare him for a successful first ride? Prevention is always better than cure.